shelter at Mt Field National Park. 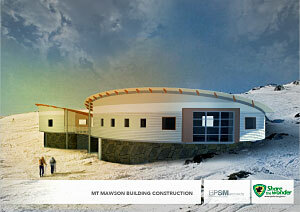 THE Southern Tasmanian Ski Association has welcomed the announcement that tenders have been called for the construction of a new public shelter at Mt Mawson within the Mt Field National Park. “This is an exciting development, and one that the Southern Tasmanian Ski Association has been advocating for a number of years,” STSA president Peter Davis said. "It has been clear for some time that the temporary shipping containers on site are inadequate and STSA has expressed concerns about visitor safety and amenity," Dr Davis said. "It is great news ... that plans for a new purpose-built public shelter at Mt Mawson have now progressed to the pre-construction phase," he said. Parks, Environment and Heritage Minister Matthew Groom said the new shelter would consist of two new buildings to be built on the site of the Sitzmark Lodge that was removed some years due to its deteriorated condition. "The buildings will provide a public shelter and toilet facilities for walkers, skiers and snowboarders, in addition to providing ski patrol and first aid facilities for the Southern Tasmanian Ski Association," Mr Groom said. "The existing temporary shelter will remain in place until the new buildings are complete to provide facilities and shelter throughout the coming winter, with constructed expected to be completed during the summer period. The government recognises the value of our national parks to Tasmania’s booming tourism sector, and upgrades such as this ensure we can deliver a world class experience and enhance our growing international reputation for nature based tourism," he said.